On Monday, thousands of members of the organization Abahlali baseMjondolo, the shack dwellers movement, along with their allies from the National Union of Metalworkers of South Africa and other movements, marched in Durban against state repression and attacks that they have suffered as a movement. 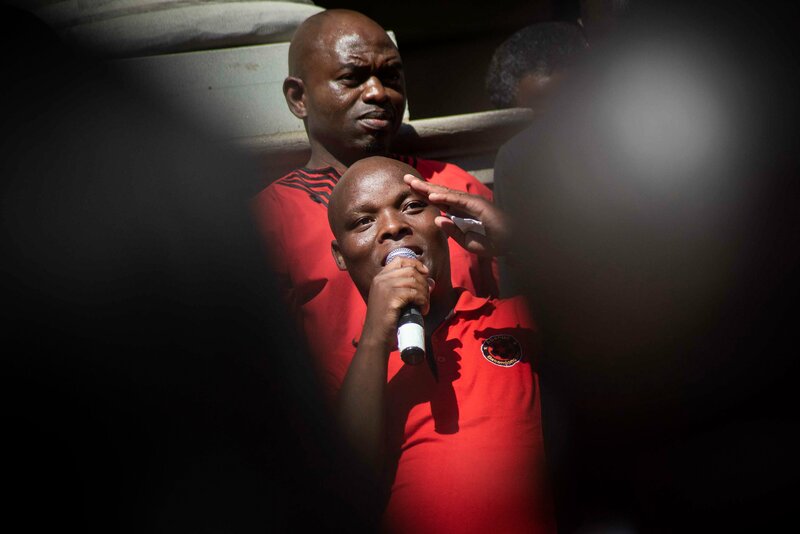 Peoples Dispatch had the opportunity to speak with Mqapheli George Bonono, an elected member of Abahlali baseMjondolo’s interim national council, about the movement itself and the repression that it is facing. Peoples Dispatch: Could you tell us a bit about Abahlali baseMjondolo and its history? Mqapheli Bonono: Abahlali baseMjondolo is the shack dwellers movement. It is a human rights organization that stands for the rights of the shack dwellers to be in the city. We also fight against the brutal evictions that take place against our people when they move from the rural areas to the urban areas. The movement was established in 2005 in Kwazulu Natal and today, is critically growing because of the work that we do. Today, we have 55,000 members that are audited and in good standing. At the same time, we are facing a lot of repression, from the capital system, especially the ruling party in South Africa, the ANC itself. We have lost a lot of comrades, we have received death threats. While we speak now, the president of the movement S’bu Zikode is underground; he cannot work freely. We cannot even organize and mobilize freely outside because of the threats that are coming to the movement.There are a number of comrades now that cannot return home. They have to work underground. PD: Can you talk about why people in South Africa are moving from the rural to the urban areas and what are the challenges that people face in that transition? MB: First of all, the areas that we work in are provinces and rural areas that have been neglected by the government, with no schools, no hospitals, with no universities, no job opportunities, and no infrastructure. So when children in these areas grow up and finish school, they are faced with these challenges and are forced to move from the rural areas to come to the urban areas. The first thing that happens when they come to the urban areas, the first challenge, is that you need a job that can provide for you, a decent job, and you also need a place to stay when you get to the cities. That is why most of our members occupy land. When they reach urban areas, they find themselves homeless and landless. So when they see a piece of land unoccupied and abandoned, they will try to build a home there. Then, often times, they are threatened with eviction by the municipality. In South Africa, there is an armed force that is called the Anti-land Invasion Unit. It was formed by the state and its task is to deal with evictions. In South Africa, the law says that if you want to evict anybody, you must first go to the court and get a court interdict, as well as providing a housing alternative for the people. You technically can never leave someone homeless or landless. So this armed force, the Anti-land Invasion Unit is created to “defend the municipality,” because when people try and build their homes on these vacant lands, the middle class starts to get annoyed. They talk about the value of their houses. They claim that if a shack is built next to their house, its value will come down. So they start inviting the Anti-Land Invasion Force to come, brutally shoot people and make sure that they get rid of the shack dwellers in the area. That is why a big part of our work is against evictions. In 2007, the legislature of Kwa-Zulu Natal even announced the Slums Act, an act which sought to “regulate” substandard housing but basically called for the elimination of slums and shacks. This law was proposed before the World Cup in South Africa, it had the intention of clearing all of the people – poor people – from the big cities, so as to hide them and not expose the fact that in South Africa, there is a crisis with people living in the shacks in very bad conditions. We took the government to court to have the act declared unconstitutional and we won! So we became a big threat to them. Each time we take them to court, we win. There are currently two former ANC ward councillors Mduduzi Ngcobo and Velile Lutsheko serving life terms in jail, along with the hitman, for the assassination of Thulisile Ndlovu, a young woman and chairperson of an Abahlali branch. They assassinated this young woman because she was exposing corruption. PD: Why is there no dignified housing for the people who are moving from rural areas? MB: At Abahlali baseMjondolo, we clearly know that there is no house that will be provided for us. It is impossible to get affordable housing in South Africa. They build the houses but they don’t go directly to the people that need them. Even the houses that they do build do not provide dignity for the people. So we are asking them to give us the land so our people can build their own homes, so they can have the liberty to build their homes and not be under threat of eviction, with the government saying this is a big city and this is the type of structure you must build in the city. And at the same time, our members also do not have access to decent jobs, to be able to build decent houses. PD: What are the principal demands of the movement? MB: Our struggle is to fight for better conditions for the people living in shacks. We seek Umhlaba Izindlu neSithunzi, Land, Housing and Dignity, because we believe that land is a necessary asset for all, because we believe in land for living, for producing food. Without land, it is very difficult to live. We also fight for housing, because in South Africa, there is a housing budget, and that housing is supposed to be allocated for the people, but these houses are not being provided to them. We demand that we be treated with respect and dignity, that we be treated as human beings and not as animals. When it is time to think about something to be done in our communities, do not think on behalf of us. Come sit with us, come talk to us. Let us be part of the planning, of the conversation. That is the kind of respect that we want. Do not go hire someone thinking that because they come from a university, they can do planning and whatnot better. Also, there are people who live in shacks that went to university too, because there is a crisis of unemployment in South Africa. So people must not think that because we are living in a shacks so we are unable to think for ourselves. PD: You mentioned earlier that 16 activists from the movement were killed in the past several years. Can you talk about the current attacks on the movement? MB: In 2014 and 2015, in Cato Crest, we faced a very very tough time where they killed our chairperson Nkululeko Gwala, and Thembinkosi Qumbela. They also killed a young girl who was 17 years old, Nqobile Nzuza. She was shot by a police officer for merely protesting on the road. An armed force of the municipality went to go demolish her house and she began protesting, asking how they could come and violate her rights. Because, as shack dwellers, we also have rights. Last year, on May 29, the police killed a two-week young old baby, Jayden. People had been protesting on the road, asking for basic services that they were promised like water and electricity. While they were protesting, the police actually chased people from the road into their houses and inside their shacks, and they threw a tear gas bomb inside one of the shacks, and this two-week young baby could not breathe and died. One week later, in a new land occupation in eKukhanyeni, Samuel Hloele, who was 28 years old, was shot dead by armed Anti-Land Invasion Unit. Until today, no one has been arrested for the murder. In November 2017, Sibonelo Mpeku, our chairperson in the Sisonke Village land occupation in Lamontville, was brutally killed. They came and kidnapped him, and brutally killed him and up until today, no one has been arrested in either of those cases. But we know that the councillors of ANC and other ANC functionaries are behind these deaths. 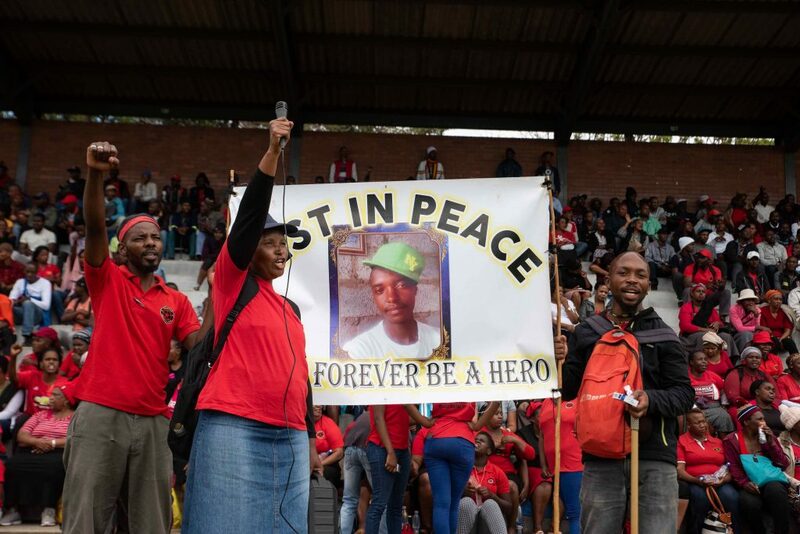 This year, on May 22, S’fiso Ngcobo was shot dead, right in front of his family, for exposing the corruption that was taking place in the area. Ngcobo was the chairperson of the local Abahlali branch in eKukhayeni, in Marianhill outside Durban. This is why we say we don’t know why they continue like this. Now, we have been told there is a list of our comrades who are going to be targeted. That is why we have sent our leader S’bu Zikode underground. The state intelligence itself approached him, saying they wanted to put him under protection. But we said that if the state itself is planning on killing us, how will they also be able to protect us with their private security. For us, it is clear that the state is behind the assassinations and the killings. That is why we marched on October 8th. We sent a letter to the president of the country and the minister of police to come and address our demands. We asked them to form a commission that can actually deal with the killings of activists, not only of Abahlali, but all human rights activists. In South Africa, its now a norm to kill them, and then it’s business as usual. No one cares and no one follows up on the suspects and arresting them. So we are standing up to say no more of this capitalist system, no more killing human rights defenders. So we call on the world to stand in solidarity with our movement, issue a statement and tell everyone what is happening to us, because we believe that if the world can speak and stand in solidarity with our movement, maybe those threats and harassment will be withdrawn. Hey Buddy!, I found this information for you: "Abahlali baseMjondolo continues its struggle in the face of brutal repression". Here is the website link: https://peoplesdispatch.org/2018/10/12/abahlali-basemjondolo-continues-its-struggle-in-the-face-of-brutal-repression/. Thank you.